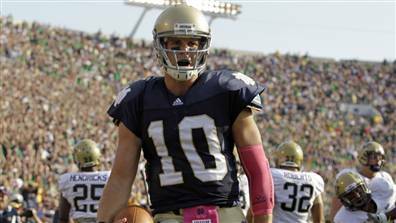 South Bend: It was his birthday today and Dayne Crist was making Notre Dame fans forget Jimmy Clausen pretty fast. His display against Pittsburg today, when he handled the offense with skill and confidence was a clear indicator that he is ready for the big time. He would have had a huge day but for the two touchdowns that were called back, the second one for a bizzarre call in my opinion. He started out the game poorly enough but once he hit his stride he oozed confidence. Clearly he is a touch quarterback, who only gets comfortable after he completes his first two or three passes. His first half running touchdown after a busted play was a thing of beauty , made up on the run like an impressive jazz riff. With Western Michigan to feast on next week followed by Navy and Tulsa it seems certain that Crist will improve even more as he learns Coach Kelly's spread offense even more. This game should never have come down to a six point one, but the difference this time was that the Irish won a close one rather than fading in the last minute. I was at South Bend and all around I could see hearts fluttering as Note Dame turned the ball over on downs with a minute 37 left to play. This time however, the Irish held and another victory was put in the win column. Finally, a great day for the Irish.